I teach knitting quite a bit. Not formal classes, but lunchtime sit-downs with coworkers, friends, and sometimes strangers at a yarn shop or fiber event. I find it’s never the actual knitting that causes the most consternation among newbies, but the starting and stopping. That is, the casting on and the binding off. Liidia’s Braid, a decorative cast-on in 2 colors. Extra points for showing this off at your next knit night. Most knitters start with the long-tail cast-on, and you can get lifetime mileage out if it. 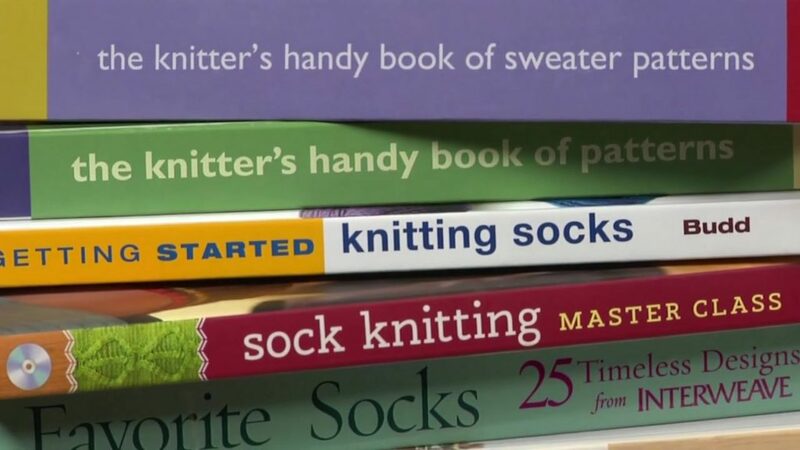 But there are a lot of other cast-on techniques that belong in any knitter’s toolbox. Some are technical sounding, such as “backward loop” and “chained edge,” while others have a historical/geographical feel, such as “German Twisted” and “Channel Island.” All have specific purposes: Some are very stretchy, some are very sturdy, some just look really cool. And some are pretty much invisible, which is sort of the point if want people to see your project, and not a wonky line of stitches at the bottom or top of it. The same goes for bind-offs: You may want something stretchy (lace knitters! ), or structured (cable aficionados! ), or just plain pretty. But with so many ways to begin and end your projects, where do you start to make sense of them all? Our latest streaming workshop, 45+ Knitted Cast-Ons & Bind-Offs is a great place. Get 4 hours of comprehensive instruction by the legendary Ann Budd. This handy chart comes with your workshop! Not only will you learn all 45+ techniques, but you’ll learn why to use them in the first place. Need to cast on stitches in the middle of a project (like under the arms or when making a neckline? A cable cast-on gives you a sturdy edge AND uses the working yarn, not a tail. Need a multitasking bind-off? The Russian bind-off is as good for delicate lace as it is for sock cuffs, giving you stretch and stability. Plus, get a variety of tips for casting on in circular knitting—from having a clean join to managing stitch markers on double-pointed needles. 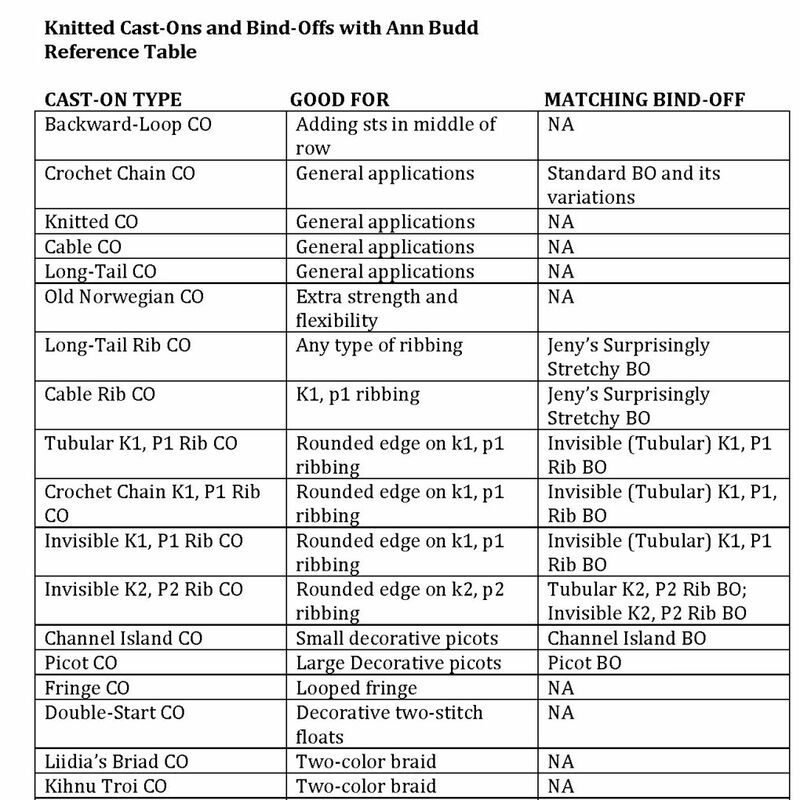 Finally, the workshop includes a handy cheat sheet detailing all cast-ons, along with their matching bind-off. Stream 45+ Knitted Cast-Ons & Bind-Offs today, for great beginnings and happy endings to every project. Some of the books Ann Budd has written. The lady knows her stuff. 45+ Knitted Cast-Ons & Bind-Offs is a new, streamable course you can watch at your own pace—anywhere, anytime, on any device. Want more bang for you buck? Subscribe to Interweave’s online workshops and tackle new techniques without leaving the house. For $9.99 a month, you can binge-watch to your heart’s content. Knit, crochet, spin, weave—hone a craft or learn a new one. Watch videos from great instructors and access and download plenty of supporting materials such as charts, photos, and worksheets. Interact with other students via our chat boards, and post your finished assignments to a shared gallery so others can see your work. We’re adding new workshops every month, so why not sign up today?